Happiness is a bride and groom who experience the wedding ceremony of their dreams. As an officiant, I do whatever I can to make that possible. Each wedding ceremony is created to suit the personalities of the individuals involved. Often, marriage is viewed as the union of two people. In reality, marriage is the joining of families. These families often include children. 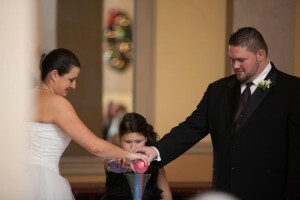 Many wedding guests are familiar with a sand ceremony, were different colored sand is blended into a unity vessel, signifying the creation of a new family. Samantha and Martin wanted to celebrate their new family with Martin’s daughter, Paige. One of Sam’s favorite things in the world is baking, and it has become a wonderful way to bond with Paige as they created delicious treats. 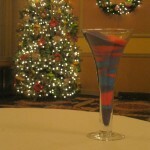 So, where there is usually colored sand to represent each individual, we used colored sugar. What a sweet way to celebrate their special day!! !